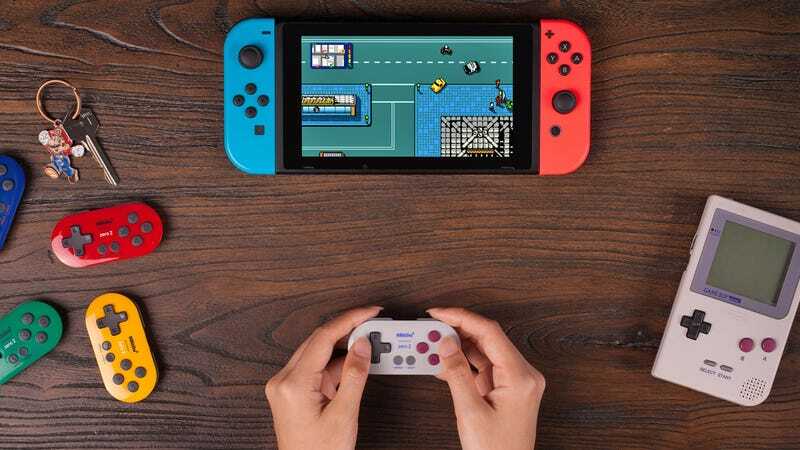 Playing classic 8-bit side scrollers with a touchscreen is awful, so 8BitDo’s releasing an updated version of its tiny, keychain-sized Zero gamepad with support for the Nintendo Switch, and motion controls, so it should be easier to be perpetually prepared for any retro gaming emergency. The Zero 2 will come in five different colors inspired by the Game Boy and Game Boy Pocket. 8BitDo has instead improved the Zero on the inside, with updates that finally make it compatible with the Nintendo Switch, including the addition of motion controls so that it functions more or less like the console’s Joy-Cons. The lack of an analog joystick means the Zero 2's probably not the ideal controller for most Switch games (can you imagine playing Breath of the Wild with a directional pad?) but with a bunch of classic Nintendo titles enroute this Fall, it does seem like a better alternative than the Joy-Cons for retro gaming. The Zero 2 will also work with PCs and Macs thanks to its wireless Bluetooth connection, but it will be especially useful when paired with mobile devices running Android where it’s easy to emulate nearly every classic gaming console you grew up with. You’ll unfortunately have to wait until the holidays later this year to slip the Zero 2 in your pocket, but with a price tag expected to fall somewhere around $20, it seems like a no-brainer if you do any kind of smartphone gaming that doesn’t involve tapping on candy.